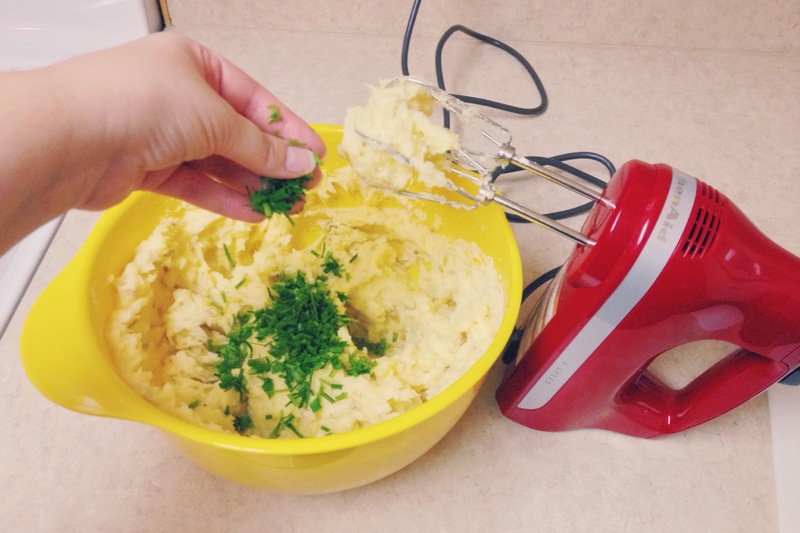 Emie’s cheesy mashed potatoes are the stuff of legend. I first sampled them during a post-college Thanksgiving trip to visit her in Chicago, and they have haunted my dreams ever since. I demanded the recipe and have been recreating them myself every year. 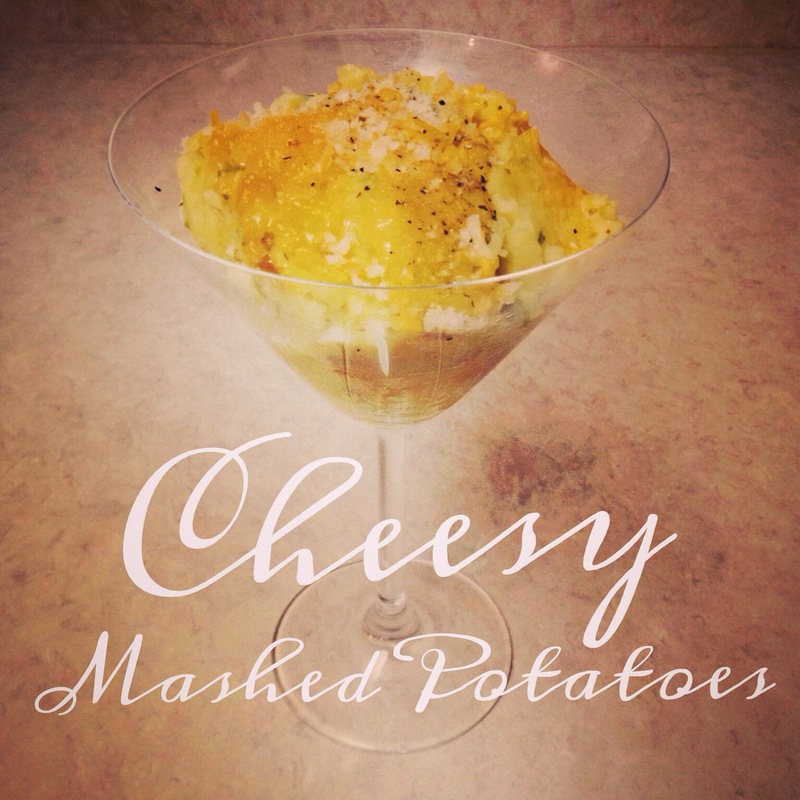 If you’re in need of a potato recipe for Thanksgiving this year, look no further! 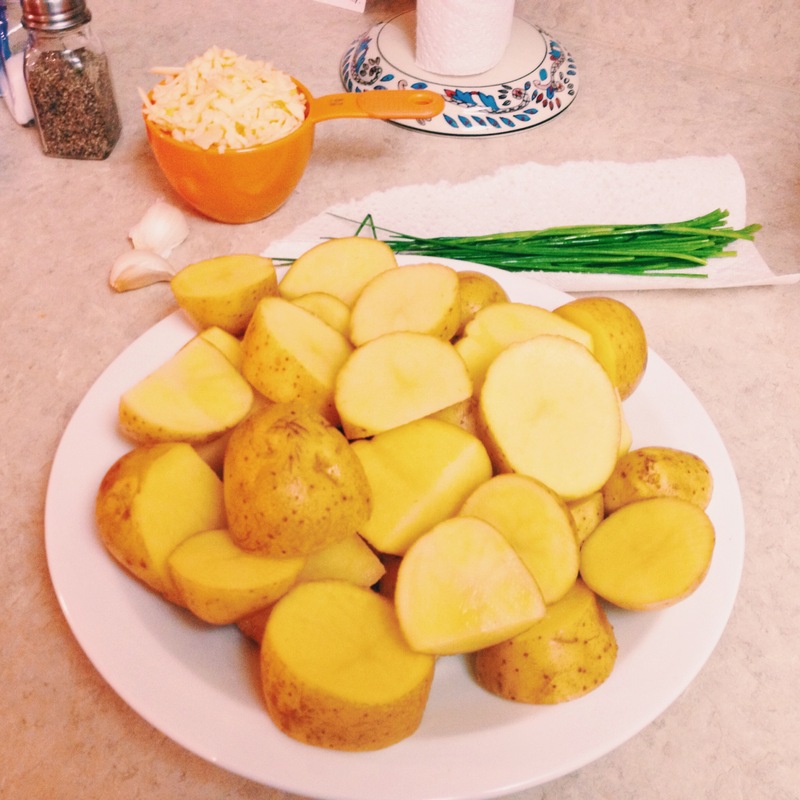 After scrubbing the potatoes, chop them into thirds (basically just make sure the pieces are all approximately the same size so they will cook evenly). Boil them in very salty/peppery water (about a tablespoon of salt/pepper should do the trick). You should boil the potatoes until they’re cooked all the way through, so they almost fall apart when you stab them with a fork in the water. Transfer all the potatoes into a big mixing bowl and while they’re still steaming hot, add the sour cream. Use an electric mixer to blend them until they’re creamy, and add the splash or two of milk. Once you’ve achieved your desired consistency, add the grated cheese and garlic and mix again. Be sure to do these steps quickly; the potatoes must be hot when you add the cheese so it all blends together perfectly without being stringy or chunky. If the potatoes are hot enough, the cheese will melt into cream from the heat of the bowl, and that’s how they’re yummiest! Add your chopped chives next, along with salt and pepper to taste, then blend some more. If you’re preparing the dish a day in advance, one tasty option is to sprinkle some breadcrumbs and additional cheese on top of the potatoes once you’ve transferred them to a casserole dish. Let it sit in the fridge overnight, and when you reheat in the oven the next day, the breadcrumbs and cheese will bake into a crispy, melty, mouthwatering crust. Serve in martini glasses for added fanciness. This recipe serves about 5 people, but I plan to double it for my group this Thanksgiving in hopes of having some leftovers – they’re equally amazing reheated. I cannot wait! (Yes, I just made this batch for the blog yesterday and I’m already excited for the next round.) 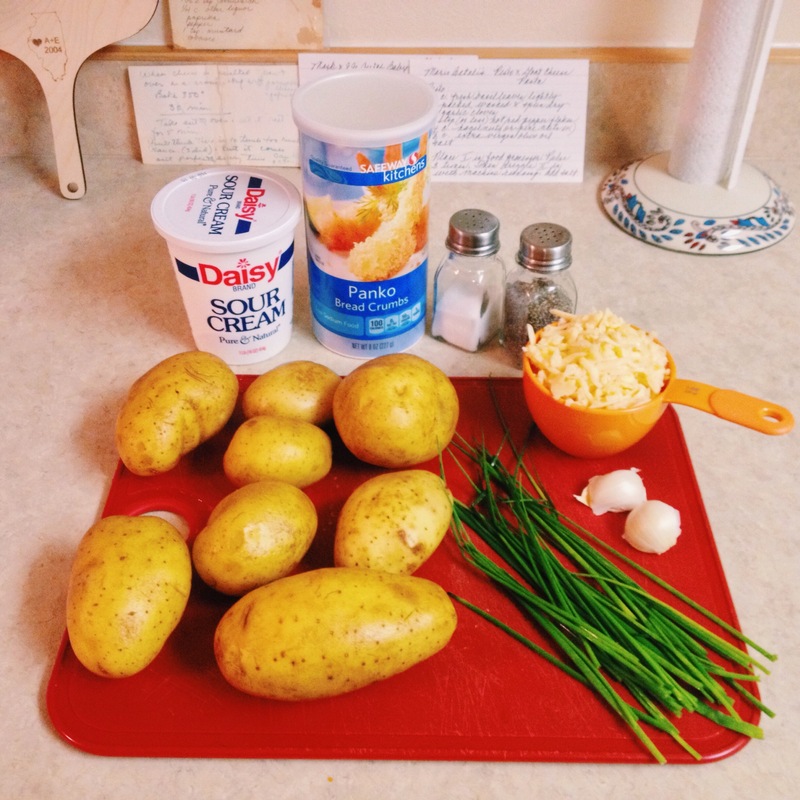 A big thank you to Emie for sharing her delicious recipe! What dish are you most excited for this Thanksgiving? Thanks Nadine! I think everything just tastes better when served in a martini glass. Thanks Arielle! 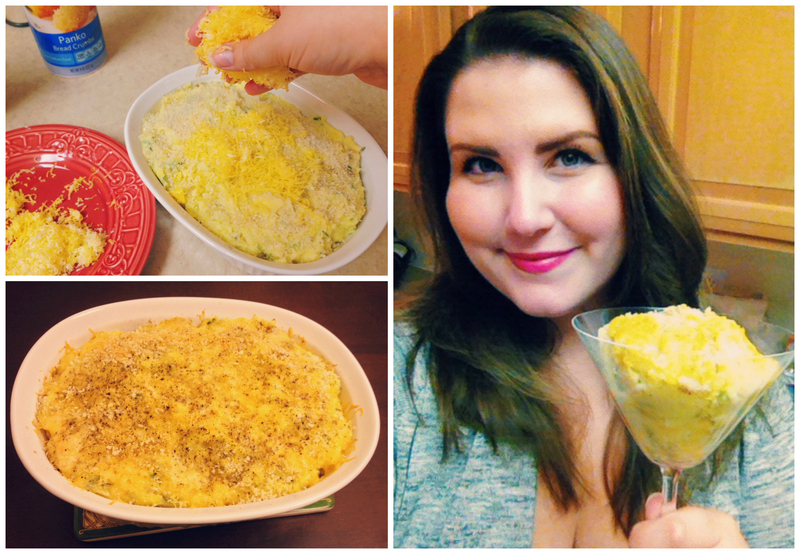 They are definitely one of my favorite things to make…straight up cheesy goodness! I’ve never felt so famous!! I hope to hear from all your friends that they were as delicious as promised 🙂 Best of luck to all!